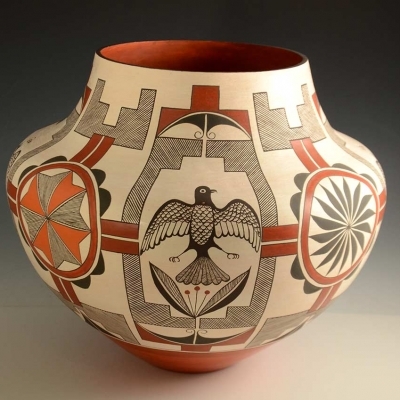 A light-colored Hopi pot with a black and red bird design by Tonita Nampeyo, the eldest daughter of prolific potter Fannie Nampeyo. This pot has a very nice polish and beautiful fire color. 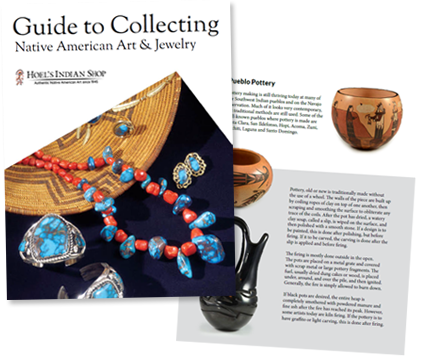 Born in 1934, Tonita is the granddaughter of the Matriarch of Hopi Pottery, Nampeyo. She is the daughter of Fannie Nampeyo and her talented siblings include Leah and Elva Nampeyo, Thomas Polacca and Iris Youvella. She has won awards for her pottery at Santa Fe Indian Market and the Heard Market. Tonita’s pottery is traditionally made without the use of a wheel. The walls of the piece are built up by coiling ropes of clay on top of one another, then scraping, sanding and polishing the surface to obliterate any trace of the coils. If a design is to be painted, this is done after polishing, but before firing. The firing is mostly done outside in the open. The pots are placed on a metal grate and covered with scrap metal or large pottery fragments. The fuel, usually dried dung cakes or wood, is placed under, around, and over the pile, then ignited. Generally, the fire is simply allowed to burn down. Traditionally Made Black Santa Clara Wedding Vase by Severa Tafoya. A beautiful hand-coiled and pit-fired pot by Cree artist Glen Nipshank.